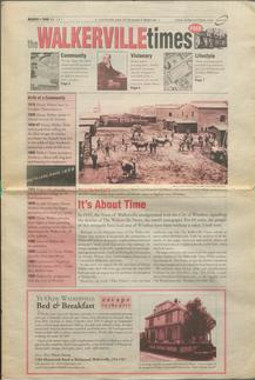 The Walkerville Times was launched on March 1, 1999 by Managing Editor Elaine Weeks and Publisher Chris Edwards. The first newspaper to be connected with Walkerville since The Walkerville News, the Times celebrated the area's unique history along with features on current issues and a wide variety of subjects. The Times was published bimonthly, with an occasional extra issue, from 1999 to 2006. It was published irregularly after 2006, with the most recent issue appearing in December 2016. Our mission is to provide the community of Walkerville with an alternative, neighbourhood orientated newspaper. Inside you'll find articles that celebrate the unique heritage of this area, coupled with features high-lighting current issues. You'll also find useful information on Health, Fitness, New Technologies, Education, a Community Billboard, and more.